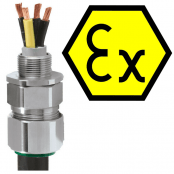 Thorne & Derrick distribute ATEX Cable Glands for the termination of cables in hazardous area Zone 1 and Zone 2 with potentially explosive atmospheres – we provide competitive prices for ATEX certified cable glands from extensive stocks to UK and international destinations. 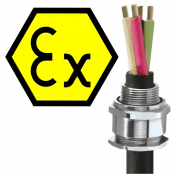 ATEX is the name commonly given to the two European Directives for controlling potentially explosive atmospheres in the hazardous area industries including oil, gas and petrochem. 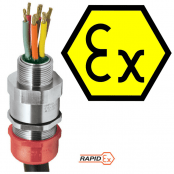 1) Directive 99/92/EC (also known as ‘ATEX 137’ or the ‘ATEX Workplace Directive’) on minimum requirements for improving the health and safety protection of workers potentially at risk from explosive atmospheres. The text of the Directive and the supporting EU produced guidelines are available on the EU-website. 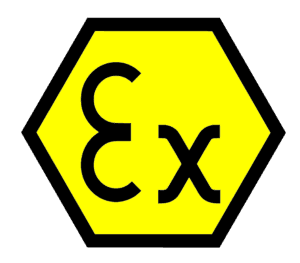 2) Directive 94/9/EC (also known as ‘ATEX 95’ or ‘the ATEX Equipment Directive’) on the approximation of the laws of Members States concerning equipment and protective systems intended for use in potentially explosive atmospheres. The text of the Directive and EU produced supporting guidelines are available on the EU website. 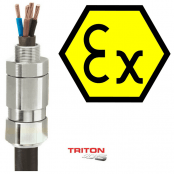 The CMP Triton cable gland provides reduced installation time, cost and risk for termination of all wire armoured or braided cables installed in explosive atmospheres or hazardous areas where ATEX cable glands are required for the following cable termination applications: Wire Braid (GSWB, TCWB), Steel Tape Armour (STA, DSTA), Aluminium Strip Armour (ASA), Single Wire Armour (SWA), Aluminium Wire Armour (AWA) and Pliable Wire Armour (PWA). 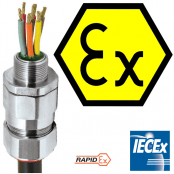 ➡ Should you require customer service or technical support please contact us – view the full range of Hazardous Area Explosive Atmosphere Cable Glands with ATEX Certification below.